The return on investment is tenfold easily. We wouldn’t be able to do without the system that we have now. 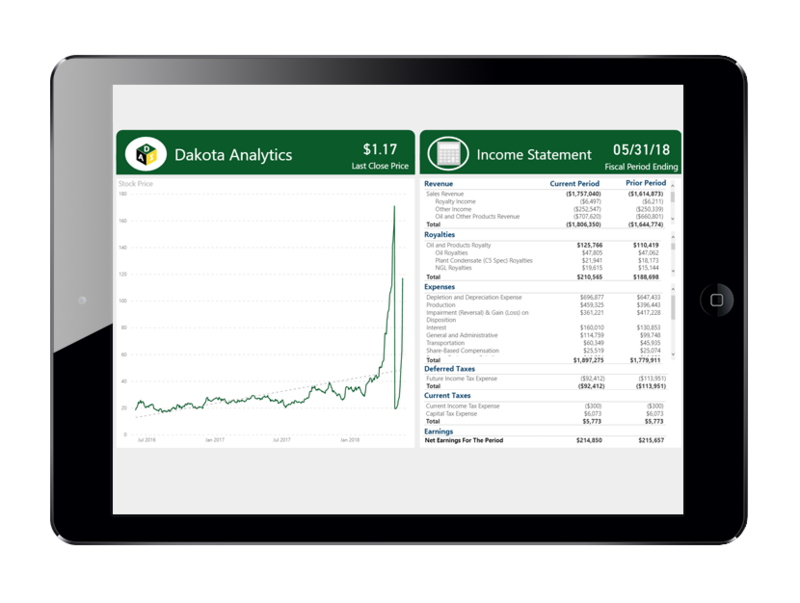 Dakota Analytics has provided us with a great return on investment. Dakota Analytics is a leader in Business Intelligence solutions having worked with some of the world’s largest energy companies. With two decades of extensive oil and gas experience, Dakota Analytics delivers analytics solutions for faster decision making, increased revenue and operational efficiencies for its clients. Energy companies must respond quickly to changes in the market. Our Business Intelligence and Data Integration capabilities coordinate and synchronize multiple data sources enabling clients to understand their assets, their production and their costs. Having this information at their fingertips empowers them with the agility and confidence to make critical decisions. Working alongside our clients, we offer services that encompass the entirety of their project – ensuring that they receive the highest quality of deliverables during each phase. All corporate reporting comes back to the Dakota solution, with the day-to-day work of the accounting group and finance, engineering and field teams all relying on a part of Dakota’s solution. It’s 11:37pm. Your kids are already in bed, and dinner’s in the fridge. Oh, and the last bus stopped running an hour ago. But you’re still tied to your desk because the management reporting package is due first thing in the morning, and the numbers still don’t tie out. And you’re thinking: there’s got to be an easier way to combine our financial and operational data into one cohesive report. We offer solutions and provide answers to our client’s most persistent data and analytic problems.